My 7th graders got an earful from me today (in the nicest way possible). They really need to stop starting every sentence with the word so. They also really need to stop starting every other sentence with and, then, or but. They also really need to stop starting every sentence with I. They can always make their writing better. My goal: To help students identify ways to improve their own writing by using actual anonymous samples from their latest creative writing pieces. We spent about 25 minutes practicing ways to improve their writing by eliminating those three problems. I included random lines from their samples – with the intent of making the task authentic and relevant. I told them it was not to make fun of anyone, but to show them that there are ways they can all make their writing better. Through some revision practice on the Smartboard and their dry erase boards, I reminded them of the rules they’ve learned this year in LA 7: subordinating conjunctions, FANBOYS, simple, compound, and complex sentences, phrases, and clauses. Before we moved onto their next task – to write another piece avoiding those three no-nos we listed above – I passed out their papers and had them analyze their mistakes. I asked them to reflect and identify their biggest writing problem. I also wanted them to come up with a solution or strategy to make their writing better. I am anxious to read their new writing assignment. Hopefully, today’s lesson was effective. He laughed all the way out the door. Last year, one of my coworkers kept talking about what I heard her says as “I Excel,” an online learning program she signed up for using one email, then another, then another…as her free 30-day trials ran out. Seeing as I gave her my email to use at one point, and tending to shy away from things like this, (why, I don’t know!?) I never got on board. I mean, I was already using Kahoot, Padlet, Quizlet, Quizizz, Skills Navigator, Schoology, and had just started using Google Classroom. Did I really need another reason for my class to be on the Chromebooks? Things changed this year when our building was able to buy the full features of the Math and Language Arts curriculum with our 21st Century Grant. Now I have incorporated IXL into my classroom, as have many teachers in the building. What should we expect from students? How can we keep it fresh? While this page has lots of inspiration for using IXL, I thought over the next several posts I would share a few of the ways I use IXL in my classroom that seem to be effective, and tell you some of the things that haven’t seemed to work. Just look at the progress we’ve made so far! What are your favorite strategies and methods? Please share your ideas, thoughts, and questions in the comments. I finally found a way to organize all of the video clips I like to use on a regular basis in class. I come back to these videos often, and I also wanted something I could post on Schoology for my students to use as a resource. Now I can easily add to this Padlet anytime I find a new video, and I can share it with other teachers (and you) as well! I’m still playing with Padlet and finding all sorts of uses for it. Right now I see it as a great place to store materials and units If you teach 7th grade, you might be ready to work on phrases and clauses around this time of the year. If you teach writing, you might be able to incorporate these pictures into writing activities as well. Again, much like my blog about Padlet and participles, I’ve created a Padlet that houses all of my notes, worksheets, and activities on phrases and clauses, as well as 15 winter picture prompts for December. I am working on adding directions to each prompt, specifically about phrases and clauses, but you could use the pictures as they are. **All of my images were taken from Google images; worksheets and notes are my own. I will be adding and editing this Padlet as I work through December as I am uncertain about the pacing and need for reteaching with my 7th graders. Hopefully you can find a way to use this Padlet in your classroom! Instead of Black Friday shopping, I’m sitting at home all cozy on the couch with the dog and a cup of coffee. As usual, I’m being my typical nerd self and having a good time creating materials for class next week. Last year, my co-teacher was very clever with the Elf of the Shelf idea and hid our class elf, “Schnoodlemint Fairypie III,” around the room every night for the last few weeks before Christmas. The students enjoyed seeing and writing about the trouble he’d gotten into each night. 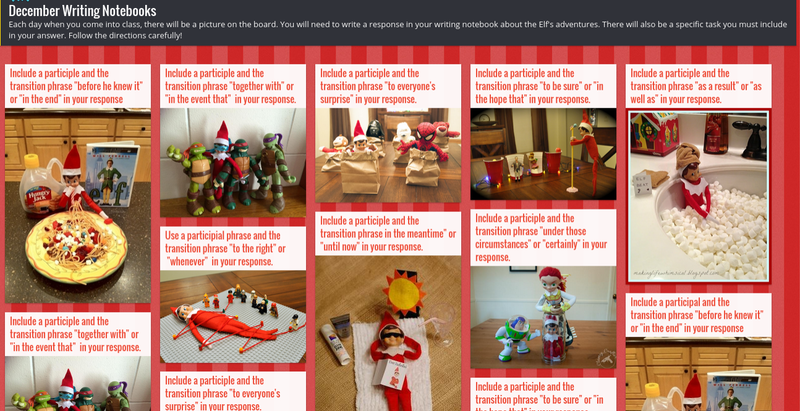 This year, I decided to do something similar in my resource room, but instead of actually buying an elf and doing all the work, I just created this Padlet, which will hold all the adventures of the elf, in one easy-to-access place. As you can see, my 8th graders are learning about participles and also desperately need practice with transitional words and phrases. I took all the images off of Google images and made up each prompt from a list of transition words and phrases. I may have to supply some participles in the beginning. My plan will be for this to be the opening activity when they arrive. We will transition into grammar, and then I’ll give them a few minutes to wrap up their writing for the day, or have them complete it for homework, before we move on to our main lesson. 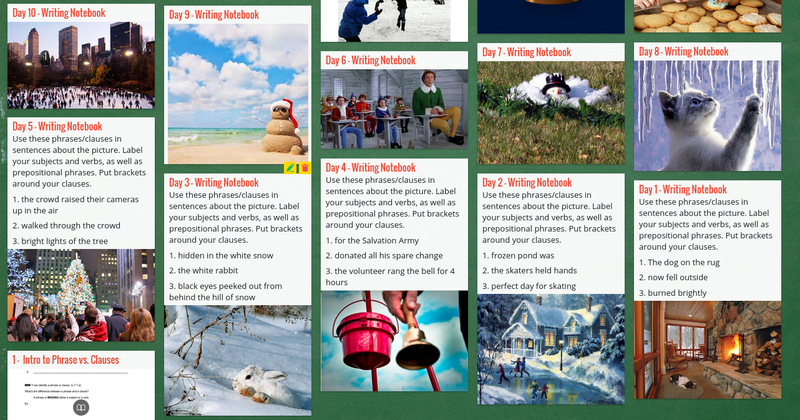 If you would like to use this Padlet with your class (if you are specifically teaching participles), you make access it by going to this link: December Padlet The password is “jolly.” You will not have writing privileges, but you could check it out for more ideas. Stay tuned for more December ideas! I know it’s a rough, but fun, month! Tomorrow looks to be a day full of interactive, technology-based assessment in my classroom! I have a student teacher starting during the 2nd semester, and he’s coming tomorrow to get his hours of observation in. Last week he let me know that he needs to observe some use of technology to assess students for his current class. I didn’t want him to watch the same thing four times in one day, so I decided to do a different activity each period. 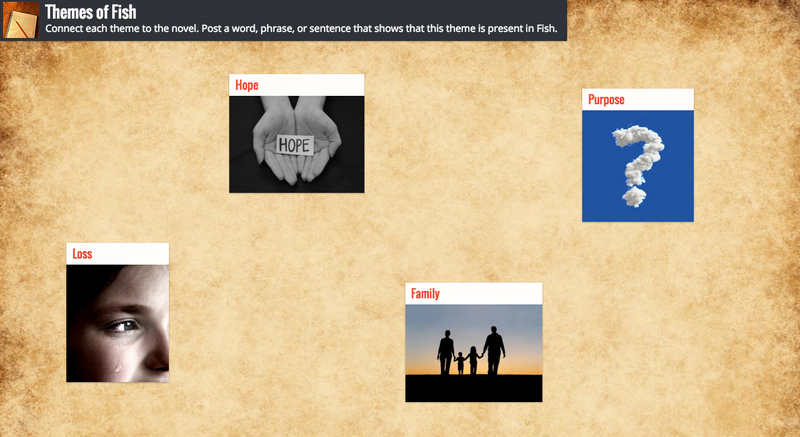 1st period LA 7 will be completing their first activity on Padlet, which I am super excited about. They will be writing about various themes from our novel. I am brand new to Padlet, but I practiced using it with a co-worker Saturday and tested it on school devices, as well as personal devices. Don’t you just hate when you plan a technology-based lesson and the filters suddenly don’t cooperate? Fingers crossed that this is what they see tomorrow at 8 a.m.! 2nd period LA 8 will be using Plickers to do a pre-assessment for after Thanksgiving break when we start verbals. It will be short – only 10 questions. I like Plickers over Kahoot for assessments like this, because I get specific results and data to work with. I hope I am surprised that they remember some of the “8th grade secrets” I taught them last year. Even so, this will cover adjectives, nouns, and verbs as well. 4th and 6th period tutoring will be playing Kahoot to review for their science quiz on Tuesday. This is an 8th grade group studying “The Restless Earth.” Kahoot is super popular now at our school. The kids love it. It’s fast paced. It’s fun. I feel it is imperative I get control of the class after the standings have been posted so we can discuss the question and answer. I also have a 20 second rule for choosing a school appropriate name. With those rules in place, I think Kahoot can be a great tool to get kids engaged and review for a quiz or test. Follow this link to see/play: (I am not sure which link will take you to the teacher page). So it likes Mr. Student Teacher will be getting plenty to write about, and it looks like my Monday will be a fun one! If I don’t post again before Thanksgiving, have a wonderful time with your family! Teachers, enjoy your much-needed break! My 8th grade inclusion students recently started learning about verbals. As if participles weren’t fun enough, we had to add gerunds to the mix. Other than easily identifying a word that ends in “-ing,” my students felt helpless. Sometimes I get these crazy ideas for teaching a concept; they just pop in my head. Take this video, for example. I have no idea what made me think of a video with a tiny Yorkie puppy doing lots of amazing tricks. My dad had sent this video to me long ago, impressed with the dog’s talents. My Yorkie, Blue, is nowhere near as talented. I told my class to watch closely and remember as many tricks as possible. After we watched the video, my students were able to write all kinds of sentences using gerunds as the subject and as a predicate nominative. Pushing a shopping cart is the dog’s best trick. Weaving in and out of cups would be hard to teach. The puppy’s cutest trick is skateboarding. Wrapping herself up in a blanket was the cutest trick. Painting is a trick I would never expect a dog to do. Pushing the car with her nose was a cute trick. Putting away the laundry is a trick I should teach my dog! The first trick I would teach my dog is doing my homework! Of course, you know me, I’ve been trying to think of other ways to incorporate viral videos into my practice activities in Tornado Time. Knowing your students best, you probably already know what kind of videos you’d want to use. Think of how you could get your students writing with particular parts of speech or sentence structures by giving them a visual prompt like this. What viral video clips do you love? What great ideas just popped into your head? I’d love to hear your ideas in the comments! So, I’ve been sick, and my students have been sick. It was also raining this morning, and it was time to start prepositional phrases. They were not very impressed, nor were they motivated by my “Interactive Grammar Notes” from the textbook to introduce this concept. So today, the Queen of English made her first public appearance. 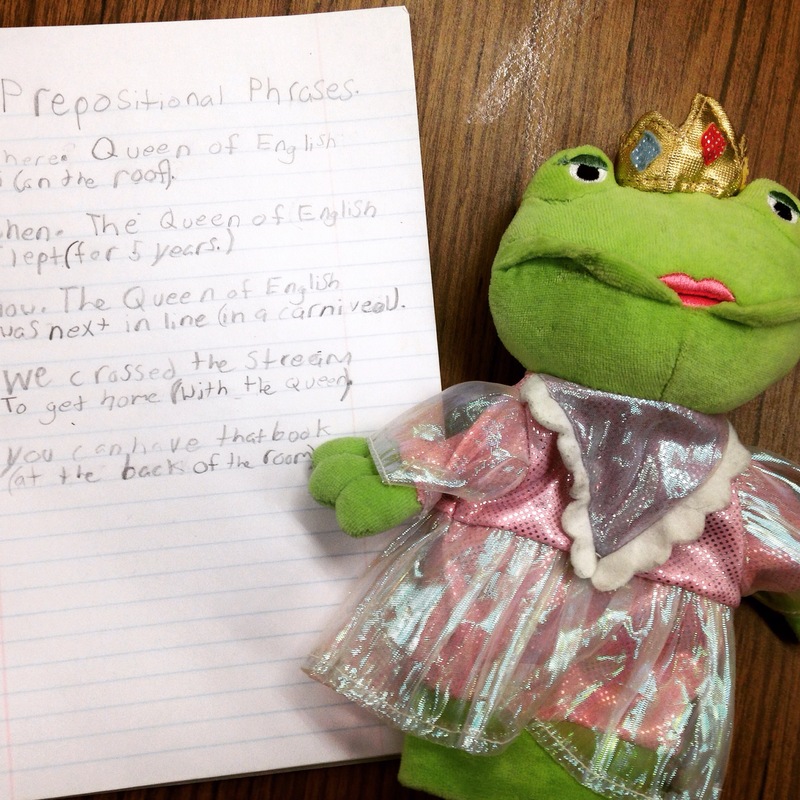 Dressed in her finest, she became the subject of all of our sentences and she was a wonderful model of the correct use of prepositional phrases. She was inside a binder. She was sitting on a student’s head. She was hiding under the table. She was looking out the window. I even stuck her outside the window. Desperate times call for desperate measures. The Queen of English is silly and juvenile, but it works with 7th grade, especially when I fall into the role of Queen. Then they really love making her do silly things! They had the Queen doing all kinds of things in their sentences. She even met some of the characters in our novel and went into the cave with Tiger. Silliness like this opens up lots of room for creativity and gave the students a chance to explore prepositional phrases, which was a totally new concept, without feeling threatened. I mean, who’s afraid of a plush puppet? Today was kind of an exploration day to kick-0ff prepositional phrases. However, I’m sure we haven’t seen the last of the Queen…. Week 8 and 9…and 10 were a total blur. These weeks consisted of sports, my first IEPs of the year, PT conferences, our spirit week, a huge presentation at work, and very little sleep. So now I’m moving into Week 11 which is the first week of the 2nd nine weeks. We have been continuing with Fish and working a lot with the vocabulary, as well as an annotation strategy that the kids really enjoyed. If the wolf mistook Tiger for her cub, why was she reluctant to approach Tiger? I’ll leave you with the rubric/checklist my students used for self-evaluation of their Tic-Tac-Toe. Tic Tac Toe Writing Checklist Rubric Students had to complete this checklist prior to turning in their writing notebooks. It definitely saved me some time on grading and their final products were better when they knew what I was looking for!! Hope you had a good week or two…or three!